EXCLUSIVE: Watch ‘Ciao Adios’ official music video from the British KIDZ BOP Kids (cover of Anne Marie)! The track is on the new album KIDZ BOP 2018 - out 10 November 2017! It’s a Fun Kids Exclusive – we’ve got another NEW music video from the British KIDZ BOP Kids! In the new video, KIDZ BOP Kids stars Twinkle, Ashton, Lois and Max have covered Anne Marie’s massive hit single ‘Ciao Adios’ and put their own amazing spin on the track! Watch the official music video for Ciao Adios! Ciao Adios is one of the tracks on the new KIDZ BOP 2018 album, which will be available in the UK on 10 November 2017! Kidz Bop cover this huge tune! You Laugh, You Lose with Greg James! Click here to pre-order KIDZ BOP 2018! KIDZ BOP 2018 is the second album featuring the British KIDZ BOP Kids, who earlier this year stormed onto the UK Charts with their top 10 debut album, KIDZ BOP. The album reached #7 on the Album Chart and spent nine weeks in the UK Top 40. The group’s second album will feature family-friendly versions of today’s biggest pop hits, including ‘Castle On The Hill’, ‘Symphony’ and ‘Stay’ all sung by The KIDZ BOP Kids! Click here to watch the official music video for Stay! Some of the tracks also have music videos, which you can find on the official UK KIDZ BOP YouTube Channel. You can also see the British KIDZ BOP Kids on your telly and in-person this November! The group are going to be appearing on CITV’s Saturday morning show Scrambled later in the month and they’ll be performing at the world-famous Hamleys Christmas Toy Parade on Regent Street on 19 November! Are you a fan of the new KIDZ BOP Kids video? Let us know in the comments! 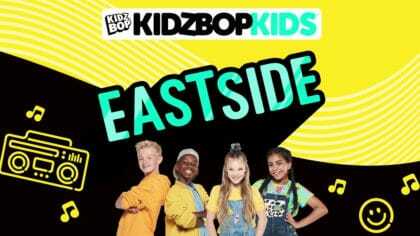 Hear KIDZ BOP cover Eastside! Kidz Bop cover Thank U, Next! More You Laugh, you Lose!